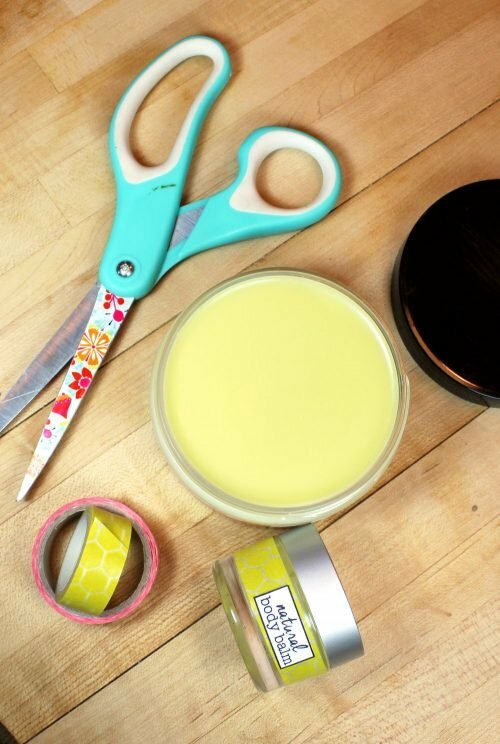 This natural lanolin salve recipe makes a wonderful alternative to commercial lotions and creams for hydrating and protecting extremely dry skin. Lanolin is a naturally occurring wax that is secreted by the glands of sheep and other wool bearing animals that helps them shed water from their coats. When sheep are sheared in order to use their wool for textiles such as yarn or felt, the wool is first run through rollers in order to extract the lanolin. Because lanolin is very similar in composition to the oils secreted by our own skin it’s able to provide a protective moisture barrier when used in skin care products. It acts as an excellent moisturizer and skin smoother as it’s capable of not only penetrating the outer layers of our own skin while still allowing it to breathe, but it is also a humectant able to attract and absorb up to 300% water. According to Wikipedia lanolin is superior to both petroleum and glycerin with its emollient effects lasting for an eight hour period after the first application and up to 72 hours after a fifth day of consecutive use. 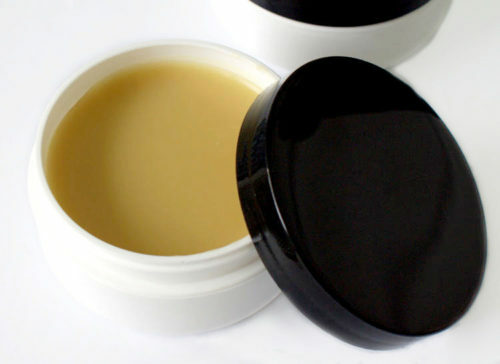 Therefore a lanolin salve is perfect for severely dry and cracked skin, eczema and psoriasis. In addition to the lanolin in my natural lanolin salve recipe, I’ve also used calendula and virgin cold pressed pumpkin seed oil. While calendula is proven to help promote healing, pumpkin seed oil helps to repair dry and damaged skin. Nutrients that include Omega-3 and Omega-6 fatty acids, Vitamins E, A, and C, and zinc aid in this process by promoting skin health. To make my natural lanolin salve recipe, you’ll begin by using a digital scale to weigh out the beeswax. Combine in a glass Pyrex measuring cup then melt in either a double boiler or in the microwave at 40% power until melted. Carefully remove from the microwave using a pot holder. (The handle and container will be very hot.) Then weigh out the lanolin and stir into the melted beeswax. Continue stirring until the lanolin has melted completely. Next, weigh out the calendula herbal oil and the pumpkin seed oil and stir into the lanolin and beeswax. Using a different pipette for each oil, add the tea tree and lavender essential oils, rosemary extract and vitamin E.
Stir well then pour 1.5 oz. of salve (by weight) into each of the two 2 oz. containers. Allow to cool, then cap tightly and store in a cool, dry location. If you like my natural lanolin salve recipe, then you may also be interested in trying some of my other homemade recipes with lanolin. Following are some of my favorites. Don’t Miss Any of My Skin Care Recipes! Don’t miss out on new bath, beauty and skin care from Soap Deli News! You can follow me across all of your favorite social media platforms for updates on new posts plus other great information from around the web! Find and follow me now on Pinterest, G+, Facebook, Twitter, Blog Lovin’, and Instagram as well as subscribe to Soap Deli News via email for future updates, DIY projects and recipes. Great recipe! This will be great for moisturizing as we approach fall and winter. I’ve already started using this on my feet. I love how rich and nourishing it is! I have a liquid lanolin I just ordered. Would this work and and how would it affect it? If it would make it to runny, how could I correct it? How hard is it to work with regular lanolin? 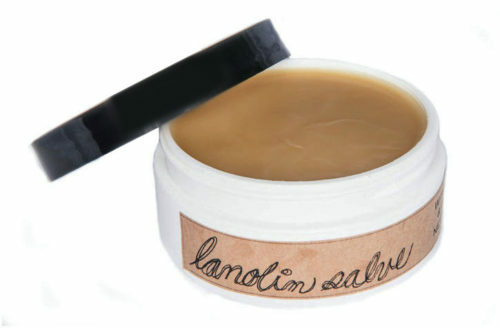 Liquid lanolin is a different product and consistency so it won’t work for this salve recipe. You could try using the liquid lanolin and then also adding shea butter however you’d have to experiment to find the right amount. I would suggest starting with equal parts shea butter, lanolin oil and beeswax and omitting the other ingredients. 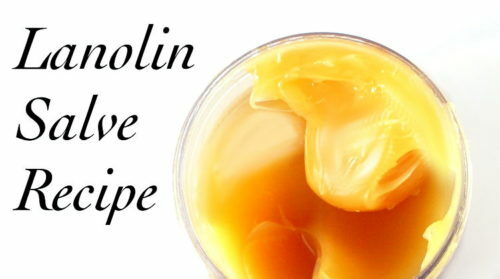 Or try just the lanolin oil and beeswax and see what the consistency of that is and then blend in other ingredients. Regular lanolin isn’t difficult to work with. It has a low melt point, but when in a solid state it is a bit sticky. Love the idea, maybe I’ll try it someday. Excited to try this but will have to purchase most items. What is the purpose of the pumpkin seed oil and the Botanic Extract Blend? Would the salve be ok without these? I just don’t know if they contribute to the moisturizing effects or the consistency factors. Thx for your input. They both contribute their natural healing properties. If you don’t want to use them you would still need to sub with another oil. Otherwise your salve will be way too hard. Do you have any experience using lanolin in dry nose? I have not, however, it’s a slightly thicker consistency than petroleum jelly so you could use it for similar applications. Hi I’ve just found this recipe and absolutely love it, in the past I have used rice bran oil which I understand is high in vit e. ? Do you think this has benefits over pumpkin seed oil? Thank you so much for sharing this wonderdul recipe. Pumpkin seed oil is richer in nutrients. Rice bran is most similar to olive oil. You can choose which you like best based on the results you’re looking for, however, if you want a more healing oil I’d opt for the pumpkin seed oil. I buy pretty much everything online in bulk as it’s more cost efficient. I link to all of the ingredients I used for this project within the recipe. I don’t have a digital scale. Do you by chance have the recipe in tablespoon, teaspoon measurements? No. Weights ensure better accuracy and allow for re-sizing the recipe easily as needed. As you need a scale to weigh the ingredients to make soap, all of my recipes will be by weight.